His Grace Bishop Abraham (previously Fr. Ishak Azmy Boules) was born on October 11, 1965 and lived in Egypt where he earned his Bachelor of Arts degree in Commerce and Accounting in 1987. Immediately following his graduation, he was ordained as a consecrated deacon in the Bishopric of Public, Ecumenical and Social Services and served in Cairo from 1988 until 1997. During this time, he was an active deacon and servant in the Church of St. Mary in Masarra, Shoubra, Cairo. On May 31, 2001, His Holiness Pope Shenouda III, along with then Bishop Serapion, ordained him as a celibate priest for the St. Paul Brotherhood in which he served until 2016. On March 14, 2016, His Eminence Metropolitan Serapion elevated him to the priestly dignity of Hegumen before he was tonsured as a monk in St. Antony Monastery in Yermo, California. 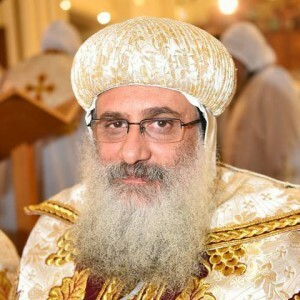 On June 12, 2016, he was consecrated as the Auxiliary Bishop for Diakonia in the Diocese of Los Angeles by His Holiness Pope Tawadros II at the Cathedral of the Holy Virgin Mary in Zeitoun, Cairo. He currently oversees Diakonia (i.e., Social Services) within the Diocese of Los Angeles under the auspices of His Eminence Metropolitan Serapion.